Chrissie Hynde is the empress of rock and roll. She is the queen. She rewrote the rules in a male dominated game like no woman before or since. She is a Space Invader. She is punk and pop and power. She is Precious. A rhythm guitarist with a style and sense of timing all her own. The Adulteress. A vocalist like no other, just as willing to spit, snarl, or grunt as she is ready to cozy-up inside a delicate melody. She is the consummate leader, focused, determined, and exploding with confidence. The kind of leader that any great band needs if they ever hope to achieve their lofty goals. She was diligent, yet patient. Searching for the right sound. The sound. When she found it, she knew. The first two Pretender albums (Pretenders and Pretenders II) will forever hover over the group’s vast catalog as the crowning achievements. This is certainly not to slight any of their many other offerings. Merely proof that you can catch lightning in a bottle. When the stars are aligned just so, inspiration shoots out of the geyser, on fire, impossible to deny. Of course, there is also a sadness that looms over these first two albums. The death of guitarist Jimmy Scott brought the exciting new sound to a ridiculously abrupt and tragic end, sealing with it the customary what-ifs that sink to the bottom of a rock and roll sea already littered with too many sunken treasures. But it can also be said that Scott’s death only cemented Hynde’s fortitude, acting as a guiding light that would continue to drive the band forward with a promise to turn tragedy into triumph. Chrissie Hynde and the Pretenders refused to be victims, refused to fall prey to rock and roll clichés. Death could not stop them. They were dragsters, shooting out of the gates with a first album that defies the logic of modest beginnings. 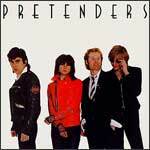 Following with equal ferocity on Pretenders II, it was obvious this was a group that simply could not be ignored. They followed Chrissie Hynde’s lead that said the only way was all the way.